The apartment SKICHOM B is located in the village of Loučná pod Klínovcem, near the valley station of the cable car Klínovec (at ca 900 m distance). The mountain Klínovec is the highest mountain of the Ore Mountains (Krušné hory). There is an attractive ski area with 4 cable cars and a number of ski lifts. The ski runs are equipped with snow cannons, of course there are also ski schools and ski rental. You can also ski in the evening on a few ski slopes. In summer you will find many marked hiking trails here. 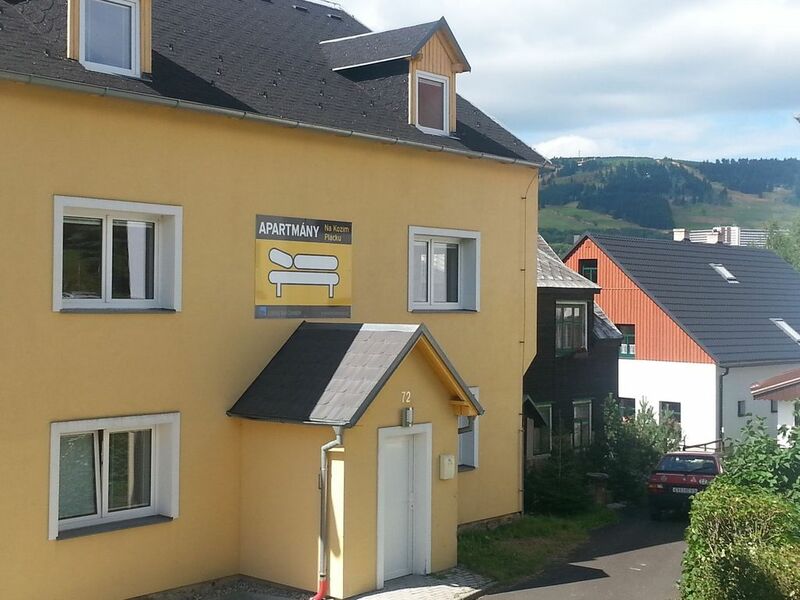 On the German side of the state border (a few meters from the house) lies the holiday resort Oberwiesenthal. In summer you can use ski buses that connect this town with Klínovec. The apartment is located on the 2nd floor of an apartment house with 7 other apartments. On the ground floor there is a large living room that all apartments can use. The apartment SKICHOM B consists of a living room with a kitchinette, a bedroom and a bathroom. The apartment house contains a total of 2 equal apartments and 6 apartments - studios (only 1 room with 2 beds). Nette Ferienwohnung, ideal für bis zu vier Personen (Familie) oder auch zu zweit. Die Küche ist lediglich etwas spärlich eingerichtet.